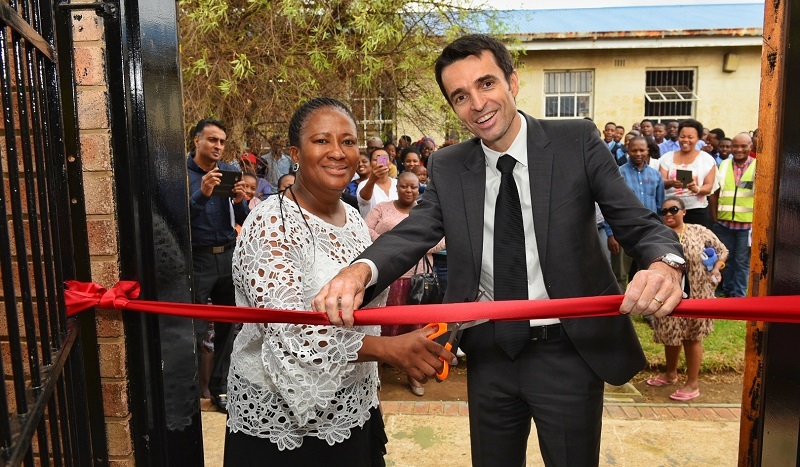 The Alstom Foundation today inaugurated a new welding school at Esibonelwesihle Secondary School, located in Duduza, Nigel area, Gauteng Province, 50 km from Johannesburg in South Africa. The Esibonelwesihle Welding School is funded by the Alstom Foundation and supported by the NGO Electriciens sans Frontières (ESF) which is in charge of the project management. This practical school provides training for young South Africans to develop welder skills for the manufacturing industry. In December 2017 the first welding was done and tested at Esibonelwesihle Welding School, on time to be ready for the opening of the Welding Class in January 2018. The school is proud to announce that they have between 25 and 30 learners enrolled under the supervision of the teacher Ms Noluxolo Nomcebo Ndlovu, of which at least 5 are female welding students. Alstom Ubunye, the Alstom joint-venture company in Nigel, has an accredited Welding School at its 80 000m2 facility and as part of ongoing social responsibility activities the Ubunye Welding School has an annual intake of 10 welding learners. The opportunity was therefore identified to collaborate with one of the schools in Nigel to introduce a Welding Curriculum as part of the Technical scope of the school for Grade 10-12 Learners, creating a strong pipeline of skilled welders for the industry. Esibonelwesihle Secondary School is located in Duduza, a township located west of Nigel, which forms part of the Ekurhuleni Metropolitan Municipality in the Gauteng Province. Its an area characterised by social-economic challenges with about 26% of the population in Duduza currently unemployed and looking for jobs. Education is key in South Africa due to the shortage of skills especially in the manufacturing industry. This kind of project creates a platform for better employment opportunities for learners and the upliftment of the Duduza community by equipping the students with extensive, high quality training enabling them to readily enter the manufacturing employment pool. At todays official opening were Mr Xavier Boisgontier, Managing Director of Alstom Southern Africa and CEO of Alstom Ubunye, senior representatives of the Alstom Foundation in South Africa; Ms. Xolisa Manqele Human Resources Director of Alstom Ubunye, a delegation from the Department of Education Mr Poovan Chetty, DCES Policy and Planning partner to the Alstom Foundation Project, Ms ES Chabalala, District Director, Mr VE Madonsela, CES Information Systems and Strategic Planning, Ms S Seete, Circuit Manager, Mr N Masheula, Cluster leader and Ms Paulina Motlaung (Principal of Esibonelwesihle Secondary School). Mr Boisgontier said: We are very pleased to be involved in this educational project, giving young people the opportunity to develop strong welding skills and to participate in the revitalization and future of the local South African manufacturing industry. The Alstom Foundation is the philanthropic arm of Alstom, created in 2007. Alstom is committed to promoting economic development and social progress especially for communities in the vicinity of Alstoms operating locations around the world. Alstom has supported 168 projects in 52 countries spread across six continents, with tens of thousands of direct beneficiaries, at a cost of around R16 million a year. Alstom is South Africas preferred partner to revitalise the countrys rail industry, boost its economy and address its people mobility needs. This is largely implemented through Alstoms two South African joint-ventures Gibela Rail Consortium and Alstom Ubunye. The combined manufacturing facility of Alstom Ubunye and Gibela consists of 80000m2 at Ubunye and the Gibela site covering more than 85 hectares which together offer a complete range of systems, equipment, services and manufacturing facilities. The establishment of Ubunye and Gibela will restore the dominant role of rail manufacturing to Johannesburgs East Rand becoming a major contributor to the regional economy and allowing the country to become self - sufficient for future demands and able to compete in the African railway market and beyond. Alstoms employees have an important role to play in the Foundation, identifying and supporting local projects.